The logic of the Sword Method takes into account these three bullet points. Additionally, since the Voter gains rewards from all 36 Votes per ELA they cast, our calculated Voter Rewards are based on the assumption that the other voted nodes have also adopted the Sword Method. To start, a Base Ratio is set. The Base Ratio divides the DPoS rewards between the Delegate and all Voters who voted for that specific Supernode. In our case, we will start with a Base Ratio of 40/60: 40% of the DPoS rewards will go to the Delegate and 60% to Voters. The second parameter is Number of Votes. As the number of votes increases, each Voter will gain less and less. Although the Supernode receives a bigger stake due to a higher ranking, the overall change will be negative for the individual voter. This is where the Sword Method really becomes alive, showing its strength by adjusting the Base Ratio in favor of the Voters. To improve the situation of the individual Voter, the Base Ratio will increase from 40/60 to 25/75 after crossing 810,000 votes. As you can see in Figure 1 and Figure 2, this is only the first of many occasions where the Sword Method shows its magic. As the number of votes increases, hitting certain thresholds, the Base Ratio also increases to ensure a fair distribution of rewards to its Voters. The Base Ratio adjustments in Figures 1 and 2 aren’t random. They ensure that DPoS rewards are distributed with a certain proportion going to Delegate pools and Voters (Figure 3), no matter how many votes the Supernode gets in total. 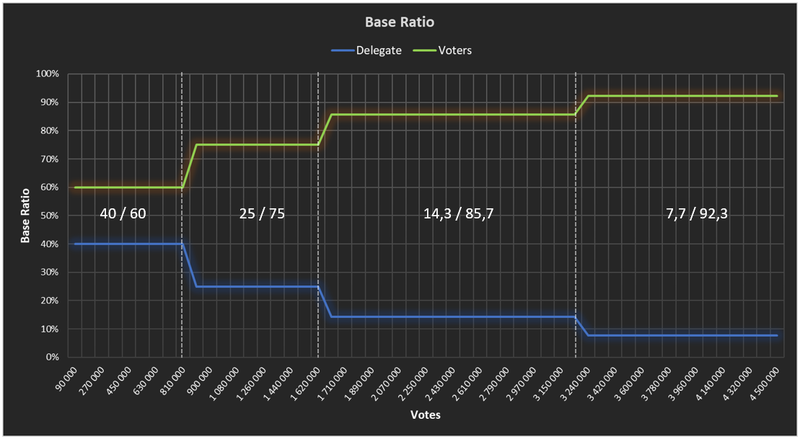 As seen in Figure 3, every time the Delegate gains two times more than the Voters, the Base Ratio adjustment is activated in favor of the Voters. 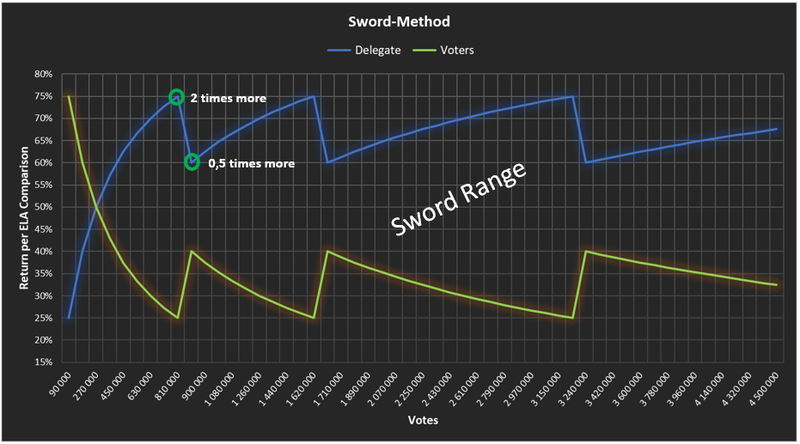 The Sword Range displayed in Figure 3 illustrates exactly how Delegate and Voters are rewarded, detailing percentages of DPoS ELA rewards given to Delegate and Voters in a clear and transparent way. The most beautiful part is that the Sword Range never changes its main structure; it only grows over time and assures fairness of distribution in DPoS rewards between Delegate and Voters. To have a better understanding of the possible outcomes of the Sword Method, take a look at table 1. This table shows a mixture of potential situations for Delegates and Voters. Keep in mind that the results of the Voters must be seen as mean values. 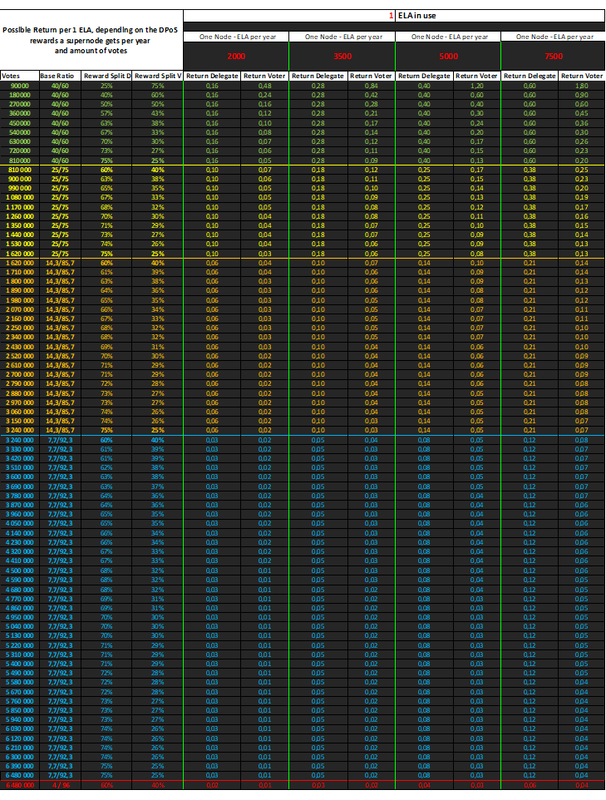 This is due to the fact that the Sword Method is multiplying the mean reward of 36 nodes. We sincerely hope that the Sword Method helps strengthen both sides of the DPoS ecosystem, giving Delegates and Voters a solution of cooperation in a sustainable way.